Dream11 - World’s #1 Fantasy Cricket & 6th Largest Fantasy Sports Site! Dream11 is India’s biggest Sports Game with an exponentially growing user base of over 2 crore sports fans. Dream11 is played by using your sport knowledge and skill. You can pick your own team made up of real players for Cricket, Football, Kabaddi & NBA. Create your team within a maximum budget of 100 credits. Your team earns points based on your chosen players' performance in the real-life matches. It's time to showcase your skill and go for glory! Join any Dream11 free or cash contest to win cash and the ultimate bragging rights to showoff your improvement in the Free/Skill contests on Dream11! Create your Dream11 team by picking 11 players as per the following combinations (C1,C2,C3...) within a budget of 100 credits. Check player info by clicking on the 'i' next to the player name at any point. Sort players as per their teams, credits or points. 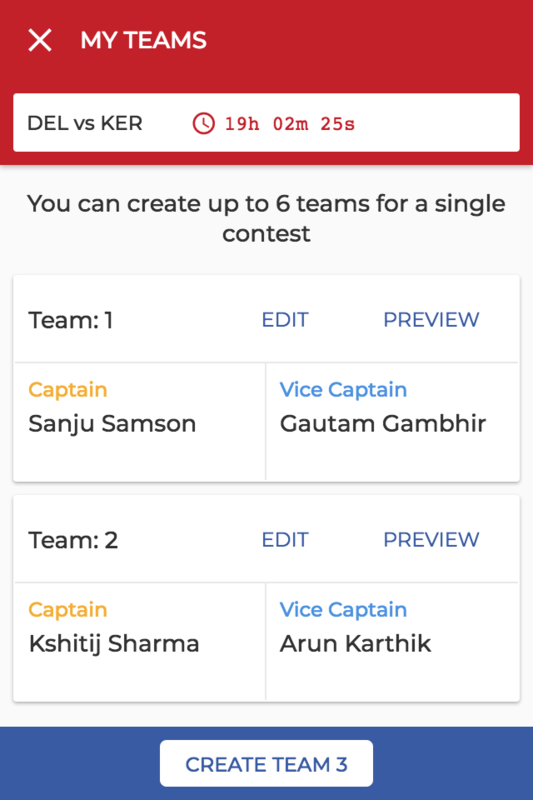 After creating your Dream11 team, choose a Captain & Vice Captain for the team. You can make as many changes to your Dream11 teams as you like until the deadline of that match! You can also change your Captain or Vice Captain before the deadline of the match. Select the “Edit Team” button to make changes to your team. Substitutes on the field will not be awarded point for any contribution they make. However, Concussion Substitutes (as defined in the Cricket Australia Playing Conditions for Domestic Matches) will be awarded points for any contributions they make in a match governed by the Cricket Australia Playing Conditions for Domestic Matches. In case of any transfer of a real-life player in the intervening period between scheduled updates, such transfer shall not be reflected in the roster of players until the next scheduled update. Please note that while the transferred player will be available for selection in the transferred team's roster of players in a Contest during the intervening period, no points will be attributed to such transferred player in the course of such contest. 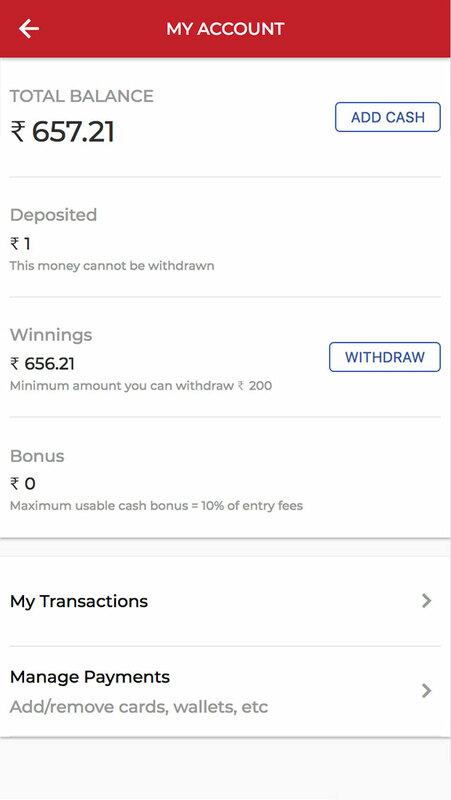 You can view, withdraw or deposit money into your Dream11 account anytime by going to the “My Account” link. You will need to go through a One Time Account Verification process before you withdraw any money from your Dream11 account. Don’t worry – this process wont take time and will not be repeated unless you change any of your details. Winnings: The amount of money earned as “winnings” through any cash leagues joined. No processing fees will be deducted if you wish to withdraw any amount from your Winnings! Cash Bonus: It’s on us! This is a bonus amount given by Dream11 to you. This amount cannot be withdrawn, however it can be used to join any public cash leagues and win more cash! This cash bonus comes with an expiry date so make full use of this freebie and get started! 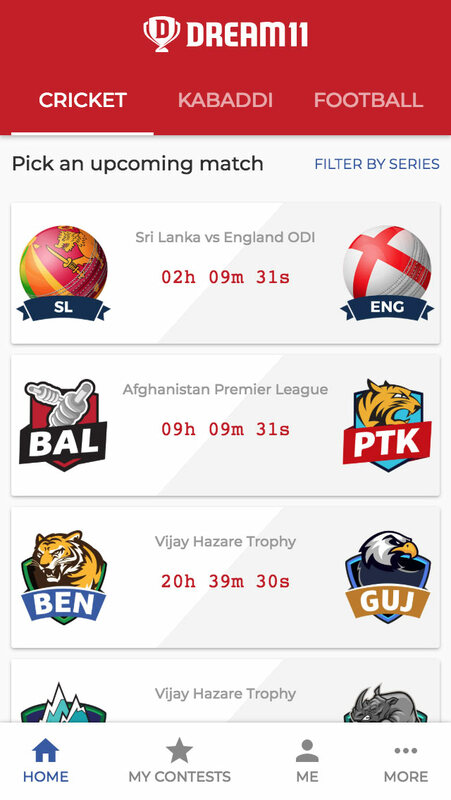 Dream11 is the world’s #1 single-match fantasy sports game of skill offering fantasy cricket, football & kabaddi to an exponentially growing user base of over 5 million gamers. That’s Easy! Log on to the Dream11 register yourself by filling out a valid email id and setting a password or by clicking on ‘Instant Connect with Facebook’ to register with your Facebook account or ‘Instant Connect with Google’ to register with your Google account. After you’re through with the registration, you can follow the simple starter guide, which will take you through the simple steps of creating your Fantasy Cricket Team and then joining Contests to win Cash. You can also go through the ‘How to Play’ page of Dream11. Please check whether your registered email address and password are entered correctly and try logging in again. If you've forgotten your password, click on 'Forgot Password', enter your registered email ID and we’ll send you a link to reset your password on it within a few minutes! If you've forgotten your registered email id, reach out to us at Contact Us. When you are logged in, head to ‘My Profile’, select ‘Change Password’ & click on ‘Save Changes’. How many Fantasy Cricket teams can I create with the same email Id? You can create only one account with one email id on Dream11. Creation of multiple accounts by a single gamer is strictly prohibited and violates our FairPlay policy. 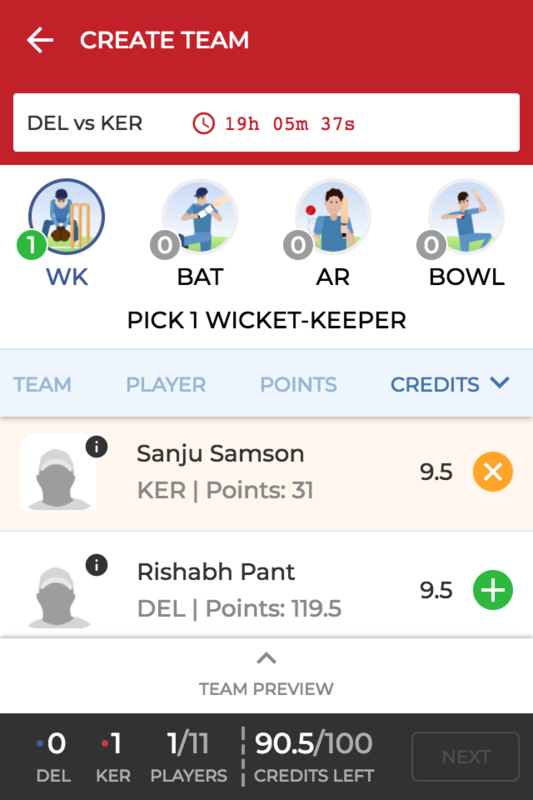 On the Dream11 app, head to ‘My Profile’, scroll to the bottom of the page and tap on the ‘Full Profile’ button next to the Personal Details section. On the desktop/mobile web, you can Contests’. You will be able to update/edit your full name and mobile number. You can also edit your date of birth, address and state if your Dream11 account is ‘Unverified’. Remember, the team name chosen by you and the email id registered once cannot be changed. I’m sure I've got the right username and password but I still can't login. That’s strange! 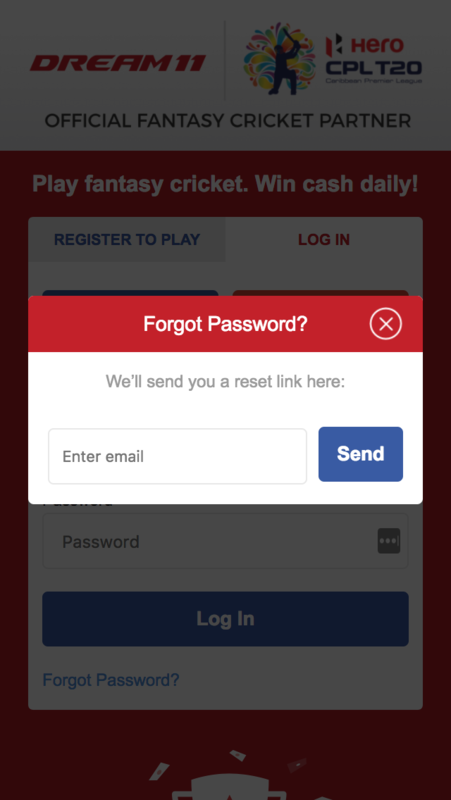 If you are sure that you are a registered user on Dream11 and are entering the correct details but are still unable to login please drop us an email us at Contact Us. Our Customer Care team will be more than happy to assist you. I did not get any email with the change password link. b) You may have entered a different email id than the one used by you during registration. For any assistance, please drop us an email at Contact Us. I don't know much about Fantasy cricket – can I still play? If you are not too sure about your cricketing knowledge, don’t worry. You can gain some valuable experience and knowledge as you play more Fantasy Cricket. 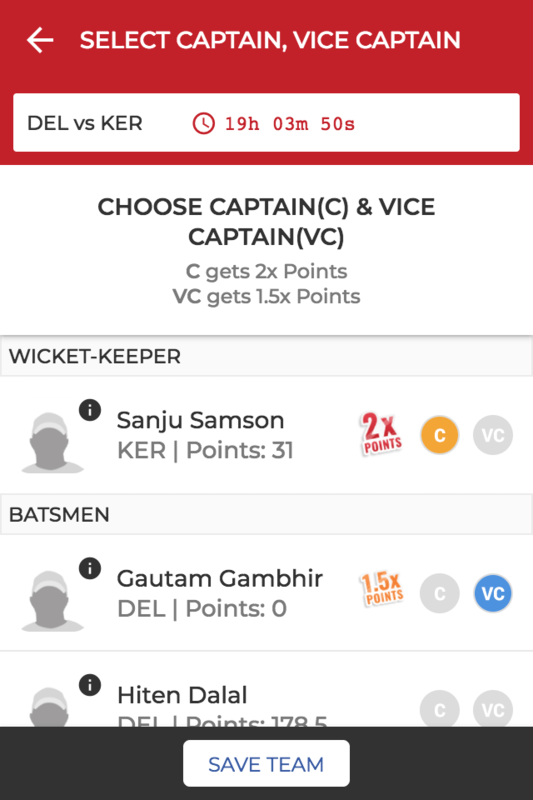 You can also check out our Dream11 ‘Guru’ to gain a better insight into the matches and players. You can practice with the Free leagues before participating in the Cash & private leagues. Our latest offering, Dream11 Season Challenge lasts over the course of a season rather than a single match. Get rewarded for joining the season contest and round contests for FREE! In Season Challenge, you have to pick players from all teams playing in a league. Unlike Dream11, you can create only one team over the course of the season. Another unique feature of the Season Challenge is that you can make up to 3 free trades every round. Use them wisely to create the best team you can.